2018 was another strong year for residential real estate in Colorado in general and Boulder Valley in particular, but what’s in store for 2019? First, a look back at 2018. Nationally, Colorado jumped from 10th to fifth among all states for one-year appreciation, with a 9.16 percent increase in home values. 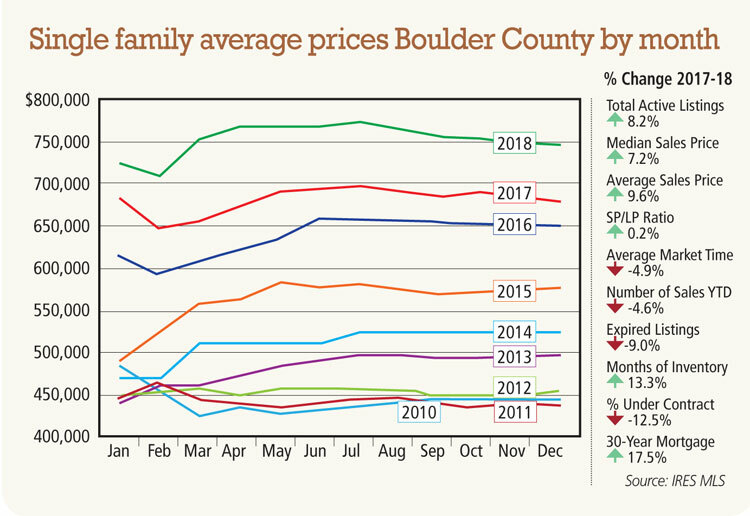 Boulder County improved from 57th in 2017 to 41st in 2018, with over 9.5 percent price appreciation. Below are the 10 “Vital Statistics” for Boulder Valley we track to gauge the health of the real estate market from year to year. As you can see, most of the indicators point toward an appreciating market, though increasing interest rates and a drop in the percentage of homes under contract indicate potential signs of weakness emerging. In the city of Boulder, the average price of a single-family home topped $1,215,000, which was up 11 percent from 2017. However, Boulder also saw almost 50 fewer home sales than last year, which highlights our continued shortage of inventory. The most affordable city in Boulder County continues to be Longmont, but even there, the average price of a single-family home is now over $460,000 and may reach $500,000 if its appreciation trend continues. One statistic that gets very little attention is that we often see home prices dip slightly in the second half of the year as compared to the first. As the chart below shows, we generally see appreciation through June or July, and then values trail off slightly. What this chart means is that, if you’re a seller your best bet is to sell in the spring, and if you’re a buyer, try to buy in the fall when home prices are stagnant or dropping. 2018 was quite strong — will 2019 be similar? Locally, conditions in our area generally support continued appreciation in residential real estate. The total number of active listings available is still less than half of what it was before the Great Recession, which is likely to keep home prices growing, especially as our economy remains strong (very low unemployment) and we continue to see net migration into our area. There are, however, several trends that could derail continued growth in our market. First, interest rates are almost a full point higher than they were in 2017, and I’ve discussed before how a one point increase in interest rates can reduce purchasing power by 10 percent. The Fed had indicated its intent to continue to raise rates in 2019, however, the news from the Fed’s most recent meeting in January suggested that they may hold off until at least June. Second, the potential for a recession in the next year or two could begin dragging on home sales. One indicator is that the yield curve (which compares rates for short-term vs. long-term Treasury notes) has been getting flatter. When the yield curve inverts (that’s when rates for 10-year notes dip below rates for 2-year notes), it is very often followed by a recession. Finally, local no-growth and anti-growth policies, regulations, and mindsets are making it increasingly difficult to add inventory to our region. The dearth of homes to sell could negatively impact our market — and it is the only factor here that we as citizens have a measure of control over. 2019 has the potential to be another great year for residential real estate in Boulder Valley, but we need to be mindful of the potential derailers mentioned above.